Steve Staicoff (known by us as S3) got his first guitar – a tiger strip Stella Harmony acoustic – when he was 10 years old. He was only 3 when the Beatles appeared on Ed Sullivan, so he missed that… but luckily, his brother turned him onto KXOK radio and The Beatles at the tender age of 7, thus beginning his love affair with music that has lasted a lifetime. The inevitable series of garage bands, jamming, and even a wedding band, carried him through the 70s and by the time he graduated college with a dual degree in accounting and music, he was ready to get out and play in a more serious fashion. 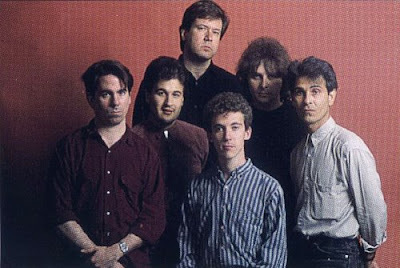 The Cleaners were formed in 1986 (picture above, S3 on the far left) and quickly became the weekend “house band” at the then-fledgling club Off Broadway. 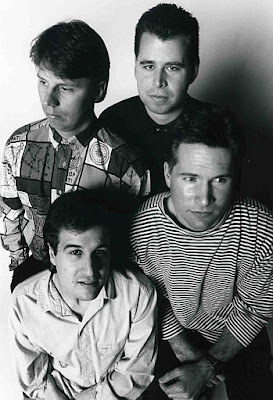 The Cleaners recorded 3 albums worth of material, 2 of which were ultimately released locally, before calling it quits. 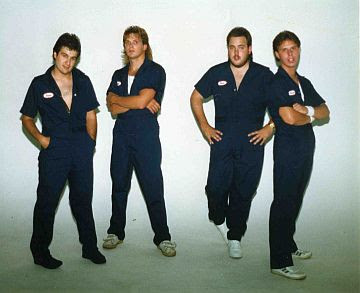 About the same time, he received a call from The Love Experts (picture above: Staicoff, 2nd from left) who were looking to replace a departed guitarist. 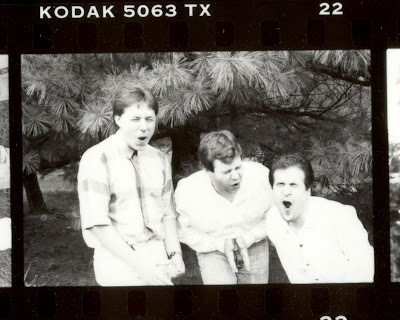 This marked the first time Steve (Loog-iano) Scariano and Steve (S3) Staicoff played together in a band. Two years and one album later, The Love Experts went on an extended hiatus. 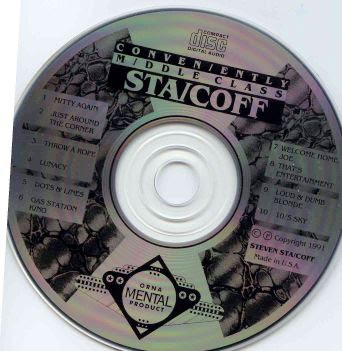 In the meantime, Steve had been busy recording hundreds of demos on his trustworthy Tascam 4-track recorder, and formed a trio simply known as Staicoff (picture above), who released one CD. Wanting to fill out the sound a bit, a second guitarist was added, and Major Steve (and His Privates) was born (picture below). In 1996, he began studies at Eden Theological Seminary, ultimately graduating with a Master of Divinity degree, and ordained status in the Christian Church (Disciples of Christ). 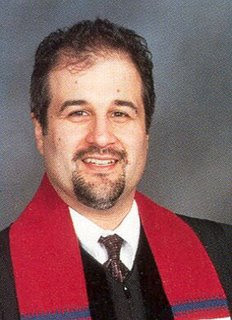 That’s his clergy photo, below! Though the playing out on weekends subsided as he served several congregations, the Sunday gig became a regular one with the various praise bands he led. Throughout the 80s, 90s and 00s, Steve continued to record at home, teaching himself the basics of computer-based recording, mixing and mastering. To date, 9 albums have been recorded, though released only to friends and other players. In February 2007, he was approached by Toby and Loog-iano with the idea of remoulding some songs from the past, and The Remodels were born. Steve carried the biggest load, playing all the instruments (except for a bit of violin from his daughter, Melody, on This Is Love), recording, engineering and mixing. He was able to pull this off while concurrently leaving the clergy (an event unrelated to the advent of The Remodels… I think) and returning to the secular work world. 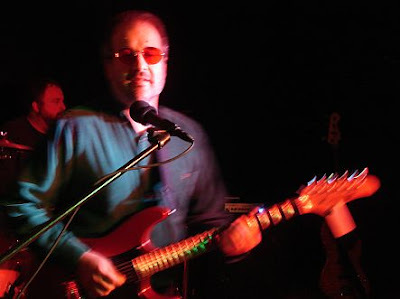 Currently, Steve plays guitar, keys and sings with the Uncle Hulka band, a group of guys who have been making music together for literally decades. He also writes country music with Claudia Aubuchon. He has not dismissed the idea of future Remodels, once he perfects the science of cloning himself! Hey Steve, Great info. How are you doing? Hey Steve…do you actually read this stuff? I like your Buckingham cover by the way.